In this post, we cover everything you need to know about Extra Magic Hour and Magic Morning at Disneyland. This includes what these offerings are, who can access them, what rides are available, and our strategies for getting the most out of them. If you’ve already read our Extra Magic Hour at Disney California Adventure post, much of this post will be redundant, so feel free to use the contents below to jump to the section you’re interested in. Let’s start with the basics of these two ways to get bonus time in the Disneyland parks—what they are, when they happen, and who can use them. We won’t be dealing with specific parks or park strategy in this section. Extra Magic Hour is a perk of staying at a Disney hotel (Disneyland Hotel, Disney’s Grand Californian Hotel & Spa, and Disney’s Paradise Pier Hotel) at Disneyland. It is an exclusive offering to those guests (but read on to learn about Magic Morning). who purchase a Southern California CityPASS in advance or at the Disneyland ticket booth. Disney uses confusing (and conflicting) language to describe exactly who gets Magic Morning. Sometimes they say your 3+ day ticket much be “purchased in advance” and other times they say it cannot be “purchase at the ticket booth.” The safest option is simply to purchase online, in advance. Better yet, purchase from a discount Disneyland ticket broker, and they should tell you at the time of purchase whether your ticket comes with Magic Morning. As we said above, Magic Morning is held at the same time on the same days as Extra Magic Hour at Disneyland Park. There is no Magic Morning at Disney California Adventure any day. Every morning I visited that park for Extra Magic Hour, disappointed guests were told there was no Magic Morning at Disney California Adventure. What if I don’t have Extra Magic Hour or Magic Morning? If you don’t have Extra Magic Hour or Magic Morning, you’ll want to start your day at the park that does not have Extra Magic Hour that morning. There’s no sense starting your day in a park with Extra Magic Hour if you don’t have it, as the waits and FASTPASS availability will be worse. 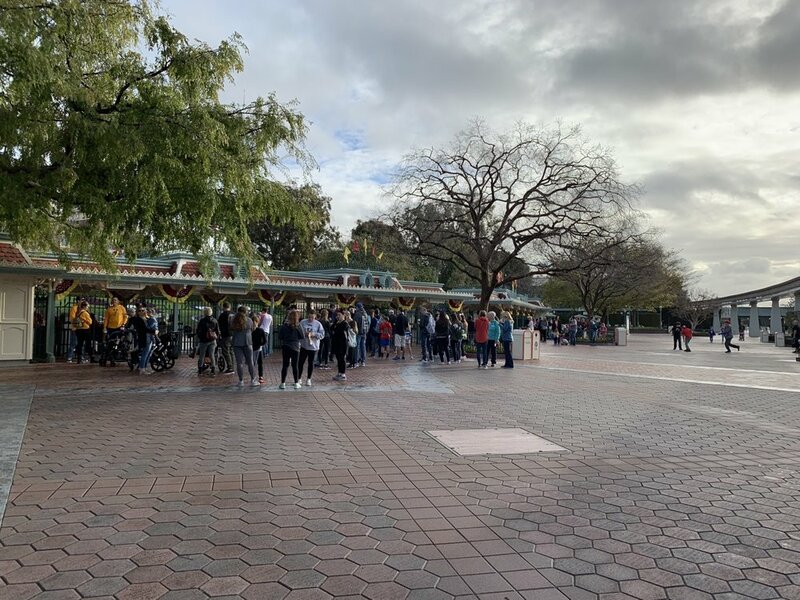 If you’re here just looking for how to start your day at the parks, we have a post on rope drop at Disneyland and a post on rope drop at Disney California Adventure. Several other guides we’ve read about Extra Magic Hour and Magic Morning miss out on some fairly fundamental concepts, so we want to take a second to explain the basic of our strategies. First, you’re here for two rope drops (when the rides open)—early and regular. You need a strategy for what you’re going to do during the bonus hour and what you’re going to do when the rest of the park opens. You get two chances to walk right up to a ride when it opens (“rope drop”)—when part of the park opens for you and when the entire park opens for everyone. Use these opportunities wisely! Whether you follow our suggested steps or someone else’s, you should always take advantage of the public opening time to get on a popular ride that is just opening. Second, still arrive early. We still recommend you arrive at least 15 minutes early for your bonus hour. Personally, we always arrive 30 minutes early. I’ve seen different rope drop protocols followed. Either guests will be let into the park early and corralled within the park until the bonus hour starts (common during the week), or guests will be kept outside the turnstiles until the bonus hour starts (common on weekends). Third, long rides and long loads are awful. Most of the rides operating during the bonus hour at Disneyland are short and quick to board. The big exception is Finding Nemo Submarine Voyage. While we avoid it because of this, there’s really no good time to ride Finding Nemo Submarine Voyage, so stuffing it into the morning hour isn’t absolutely awful. Fourth, don’t zigzag around the park. Because the bonus hour at Disneyland is confined to Tomorrowland and Fantasyland, you can’t really walk too much, but you still want to avoid jumping between the two lands if you don’t have to. It’s usually better to quickly ride something nearby than to run back and forth trying to cover things in some contrived priority. Fifth, be careful with FASTPASS rides. We cover this a bit more later, but keep in mind that if you can get a FASTPASS for a ride, it might not make sense to waste your bonus time on it. If you do, you’ll wind up in the afternoon looking at a bunch of 30 minute waits for rides without FASTPASS and a bunch of FASTPASS availability for rides you’ve already visited. Extra Magic Hour and Magic Morning are really enhanced by having MaxPass. If you haven’t yet, we recommend reading our Disneyland and Disney California Adventure FASTPASS and MaxPass guide. We generally assume you have MaxPass at least one day of your trip, and if you’re visiting for Extra Magic Hour or Magic Morning we really think you should get MaxPass for this day of the trip. Here are a few notes about MaxPass and FASTPASS during the bonus hour. There are no FASTPASS windows during the bonus hour. Check out the above photo. If the park opens to the public at 9AM and you arrive at 8AM for Extra Magic Hour, the first FASTPASS times you’ll be able to book for are 9AM or later. There is no FASTPASS window for 8AM to 9AM. MaxPass lets you book more rides than FASTPASS during the bonus hour. MaxPass will show you times for all the FASTPASS rides as soon as you’re in the park. You can only get regular FASTPASS tickets for the rides that are actually in Fantasyland and Tomorrowland, though, because you can’t access the kiosks on the other side of the park during the bonus hour. You can usually make two FASTPASS bookings during the bonus hour. You’ll grab the first one right when you enter the park for the window at the first hour of the park’s public hours. Then you’ll grab the second right at the time when the park opens to the public (because it is when your first FASTPASS starts)—usually the times will be about 60 minutes into the day for all major rides. Now, let’s talk about all things Extra Magic Hour and Magic Morning that are specific to Disneyland, including what rides are available and how you should ride them. You can read more about these rides in our complete guide to the rides of Disneyland. What rides are open for Disneyland’s Extra Magic Hour and Magic Morning? Keep in mind that these lists may change. Best we can tell, Disney does not maintain a public list. Significant departures from this list are very unlikely, but the best way to check for your trip is to use the Disneyland app. Clicking into individual attractions shows you the operational hours. You’ll need to check on your date or another day with Extra Magic Hour to see if it is operating during the bonus hour. What should I ride during Extra Magic Hour or Magic Morning at Disneyland? At Disneyland, there are two approaches to Extra Magic Hour. The first is for people who want to ride as many different rides in a single day, and it’s the approach we favor. If you’re in this group, you’ll want to avoid all rides with FASTPASS during Extra Magic Hour. This same itinerary would also be good for families with small children, as it mainly focuses on Fantasyland to start the day. All of these itineraries should be utilized in conjunction with our one-day Disneyland itinerary. Alternatively, you could visit the extra hour at Disneyland and then leave and follow our one-day Disney California Adventure itinerary. You could plan to FASTPASS Indiana Jones Adventure, but the FASTPASS queue actually merges quite early on that ride, so you’ll get on faster at rope drop. There’s also just not much else worth rope dropping at this time. They’re the three longest waits of the “minor” Fantasyland rides at 40 minutes, 45 minutes, and 35 minutes! Even Finding Nemo Submarine Voyage, the only other non-FASTPASS ride worth prioritizing is only at 40 minutes. Now keep in mind that you can ride two or three of these three in the time it will take you to ride Finding Nemo Submarine Voyage during the bonus hour. Here’s an example of how you might proceed through Extra Magic Hour or Magic Morning at Disneyland. Times assume an 8AM regular open and 7AM EMH (you can adjust for your particular day). If you don’t have MaxPass, modify this by heading straight to Peter Pan’s Flight and then grabbing a FASTPASS for Matterhorn after you’ve ridden Peter Pan’s Flight. It will cost you the time of one short dark ride. Then you’ll hopefully be able to grab a Space Mountain FASTPASS right at park opening time. You’ll be a bit behind the rope drop crowds heading into Frontierland / Adventureland. After visiting a few rides on the other side of the park, you’re in a good position to grab another FASTPASS (something nearby with a quick return time like Star Tours or Buzz Lightyear might be good) as well as to knock off rides like Astro Orbitor, Autopia, and Finding Nemo Submarine Voyage in Tomorrowland or Casey Jr., King Arthur Carrousel, and Storybook Canal Boats in Fantasyland. We’re not going to go through the detailed schedule. Basically you’re cutting a chunk of Fantasyland rides for some combination of the major rides in these lands. If you don’t want to rope drop any of Peter Pan’s Flight, Dumbo, or Alice in Wonderland, that’s fine too, but now you’re really setting yourself up to have little to do in the afternoon besides stand in line for Fantasyland rides (or ride major rides a third time). Below is an actual morning itinerary from when we visited Disneyland with Extra Magic Hour on a somewhat busy Saturday (Touring Plans put it at a 6 out of 10) seeking to ride as many rides as possible. It doesn’t follow our strategy perfectly, which is sort of the point. Sometimes you improvise, and we note where we made mistakes.